A Castle Wedding in Ireland is Possible! Have you imagined a castle wedding in Ireland? With advance planning and imagination, you can experience a unique wedding adventure with your friends and family. More couples each year marry in the fairytale setting of one of Ireland's majestic castles. Couples who live in other countries have found that a wedding at home may cost so much that they can actually spend less by traveling with a small group of family and friends to a beautiful Irish location for an unforgettable ceremony. Many of the luxury castle hotels advertise to couples looking for a beautiful and unusual wedding venue. Knappogue Castle , in Quin, County Clare. Hotel Dunloe Castle (link opens in a new window), Beaufort, Killarney, County Kerry. Lismore Castle (link opens in a new window), the Blackwater valley, County Waterford. Clontarf Castle (link opens in a new window) in Dublin. Darver Castle (link opens in a new window), Dundalk, County Louth. Loughrynn Castle (link opens in a new window), Mohill, County Leitrim. Narrow Water Castle (link opens in a new window), Warrenpoint, County Down. You may want to simplify the planning of your castle wedding in Ireland by hiring a wedding planning firm. 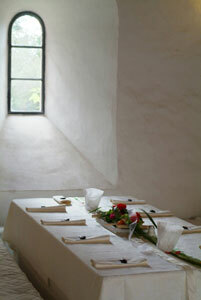 Annie Byrne (link opens in a new window) is an American in Ireland who specializes in destination weddings in Ireland. She will help you make all the arrangements for the magical wedding of your dreams. Anne Lanier Weddings (link opens in a new window) has extensive experience and a wonderful reputation for designing and providing weddings in Ireland for those who live in Ireland and abroad. Traditional Irish weddings are enjoyed by many couples of Irish heritage in their home countries outside of Ireland. They incorporate Irish wedding traditions, such as Irish wedding invitations, Irish wedding gowns, an Irish wedding ceremony including Irish wedding vows, an Irish wedding prayer, Claddagh wedding rings from Ireland , Irish wedding toasts, and Irish wedding cake. The guests find Irish wedding gift ideas to complete the event. Whether you are Irish, have Irish roots, or just love Irish culture, you can experience the joy of an Irish wedding in Ireland or at home. Slainté agus saol agat!-Health and life to you!